Mix together flour, yeast, sugar and salt. Knead until the dough is smooth and elastic (about 10 minutes by hand or 5 minutes if using a machine). Heat oil, then add onions and salt then fry gently until softened and a light golden brown. Add grape juice, sugar, thyme and oregano then simmer until the liquid completely reduces and the onions become sticky and dark – leave to cool completely. Knock down the bread dough then roll out into a large rectangle. Spread the cooled onions onto the dough, then sprinkle on the cheese. 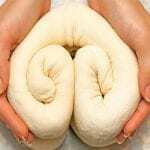 Roll the dough to encase the filling and form a spiraled sausage shape, stretch the dough to make a long thin dough roll. Cut the roll in half lengthways, leaving the one end intact, making the shape of a V.
Roll each of the arms of the “V” inwards to form a heart shape. Cover and leave to dough to rise again until doubled. Brush the dough with the melted butter then bake in a pre-heated 180C oven until the dough is golden and cooked through – the bread loaf should sound hollow when tapped.